As I’ve mentioned before in previous posts I’m a big fan of strongman events, and in particular the World’s Strongest Man. It’s the only sport I’m actively interested in (although I do enjoy the Olympics and have a passing interesting in Wimbledon) and it’s a sport I’ve followed for about the last 30 years. Ever since I was knee high to Geoff Capes and he came to our town for an event. I wanted to grow up to be just as tall and him, and some wishes do come true, because I did. For about 350 days of the year I have to endure endless talk in almost all areas of my life about Football (huge yawn), Cricket, Snooker, Formula 1 (dullest thing ever), Rugby (I do enjoy watching the occasional game) and countless other sports that don’t interest me. So, now it’s my turn to probably bore you as I talk about the 2013 final of the World’s Strongest Man. This year the event was held in Sanya in China. It was filmed in August I think, but we don’t get it on TV until December. It’s been this way for years, so I don’t complain, and quite frankly I’m just glad it’s on TV these days and is easy to find. The competition is always held in an interesting and exotic location which brings its own challenges. Sanya is by the sea, but it’s incredibly hot and wet. I don’t think any of the competitors in the final come from that kind of climate. Even the west coast Americans were struggling as they’re used to a hot and sometimes arid heat, so every athlete was constantly struggling to stay hydrated. As if the competition and the heavy weights weren’t tough enough already. Strongman events are becoming more popular every year. When I was a boy there weren’t many and they were difficult to find. Now there are several events in the UK throughout the year and in the run up to the final. The regional qualifier events, whereby the top 2 or 3 athletes qualify for WSM, are also being shown on TV, which is great too. So first there are the qualifiers, whereby it comes down to the top 50 strongmen in the world, and then 5 heats, where the top 2 from each going through to the final, knocking it down to 10 competitors. A quick note on the athletes. Despite the growing popularity of the sport, the majority of athletes work full time in normal jobs and train for strongman events in their own time, weekends and evenings, away from their families. These men are dedicated far beyond most athletes (I’m looking at you football), who earn hideous amounts of money for, in my opinion, doing very little. I respect strongmen far more than them, who just keep going, despite injuries and they do it for the love of the sport. Some athletes are sponsored by companies and are able to dedicate themselves to their training, but they’re very much in the minority. 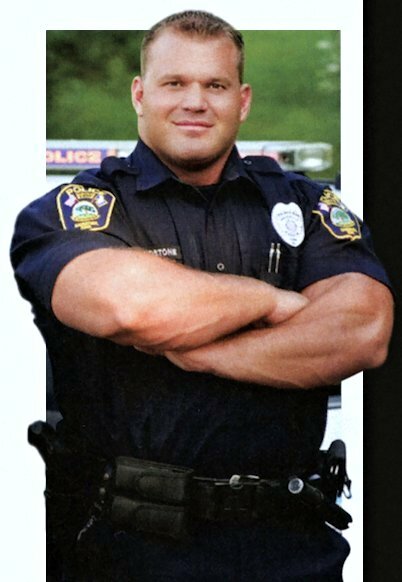 Derek Poundstone (shown above) from America is a police officer in Connecticut, Lloyd Renals is a NHS physio therapist, Krzysztof Radzikowski from Poland is a high school PE teacher, Mark Felix is a plasterer. These are ordinary guys who can do something extraordinary. They are real world supermen who can pull trucks and planes. This year, the WSM final, was probably one of the most interesting and the winner came down to the last event and the last second. If you don’t want to know who won, then skip the rest. 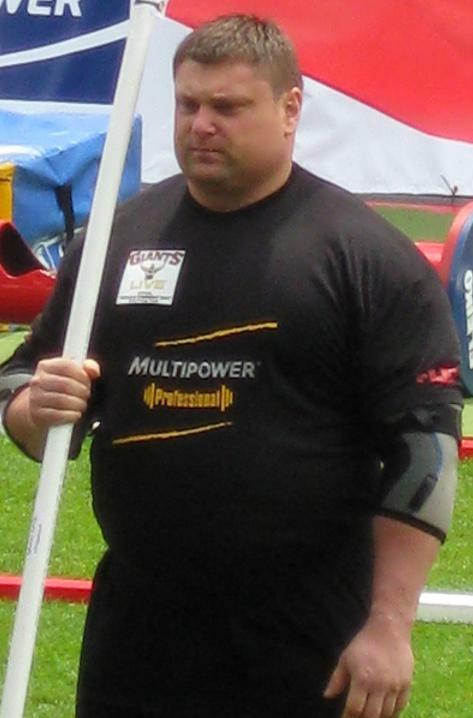 For three out of the last four years, Zydrunas Savickas, or Big Z as he’s known, has won the title of World’s Strongest Man. He’s a monster of a man from Lithuania who has broken a lot of world records and his power is utterly astonishing which has made him a legend in the sport. 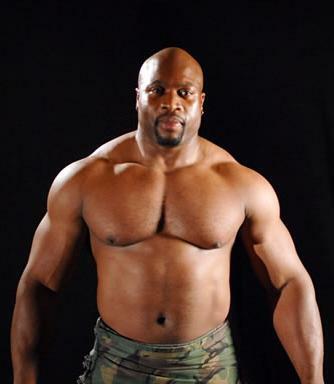 In 2011, Brian Shaw from the USA, a tall and athletic strongman managed to beat Big Z. He took back the title in 2012, but this year the top two spots were dominated by these big men. Shaw broke a world record in the deadlift event in order to beat Big Z in one event and yet he struggled with the overhead medley which Big Z won. They continued this back and forth until it all came down to the final event, the Atlas Stones, which epitomises strongmen competitions. Brian Shaw led on points overall, but it was down to who was the fastest and this year Shaw won. Looking back I think his overall performance was stronger than Big Z and perhaps Shaw was hungrier because he lost the title in 2012. Despite a problem with one arm, he seemed stronger and fitter than ever before. Of course this only increases the pressure on Big Z to push himself even harder next year to try and reclaim the title, or we might see Shaw win his third title, and equal Big Z in the number of WSM wins. The other athletes were remarkable, in particular Mike Jenkins who seemed to be getting stronger and stronger, and Mike Burke, a relative newcomer, and a very affable and down to earth American who I like very much. Most people, when asked, do you think you can win, will say yes. Burke was incredibly modest and said no, not yet, maybe one day. His goal was to be in the top 5 spots and he achieved it. Hafthor Bjornsson was much leaner and 20kg lighter this year after coming third last year, and again this year his performance earned him the same spot. But he was only one point ahead of Jenkins. Unfortunately this year the event was touched with tragedy, as Mike Jenkins passed away in November. I knew this going in to watch the heats and final, so it was gut-wrenching to see him doing so well and end up as one of the top 5 strongmen in the world in 2013. I was also very disappointed to see Terry Holland suffer with some back problems in the final. Until then he’d been doing very well, beating Big Z in one event and coming only a second behind Shaw in another. He, Laurence Shahlaei , Mark Felix and newcomer Eddie Hall were England’s best hopes for 2013, but sadly only Terry made it to the final ten. There are a lot of new names and faces coming into the sport, big young men who are incredibly strong and very driven. We’re now on the cusp of some of the older guys stepping down and yet I really relish seeing someone like the American Nick Best showing some of the younger guys how it’s done and beating them with strength, grit, and willpower. 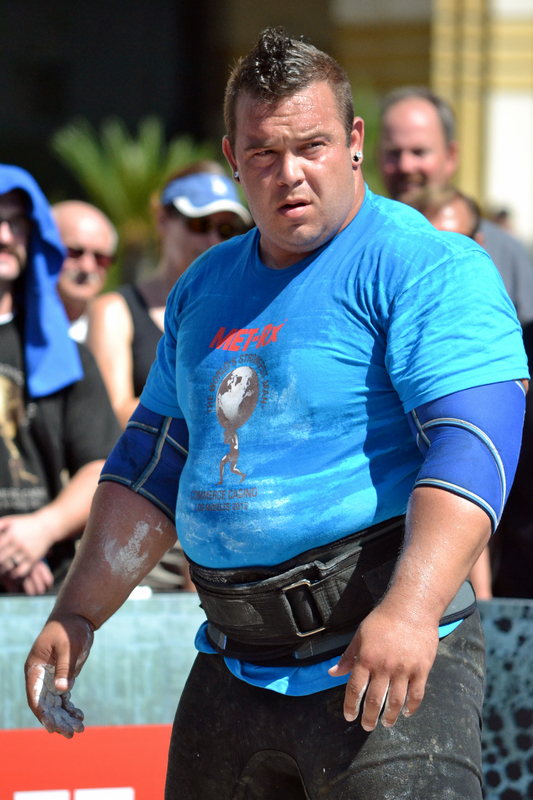 He and Derek Poundstone qualified for the WSM heats this year in their regional event. I don’t like the football, but I can understand the passion. Recently someone heard me talking about strongman events and WSM for the first time, and she was amazed at my enthusiasm and the way I rattled off the names and achievements. But then again, after so many years of watching, and more recently attending events, I do know a thing or two. WSM was brilliant in 2013 and going forward things are only going to get tougher and more exciting. I can’t wait to see what happens next.